Knights of Badassdom not only brings with it a killer cast to the table, but the story sounds so delightfully silly that it's worth being excited about. 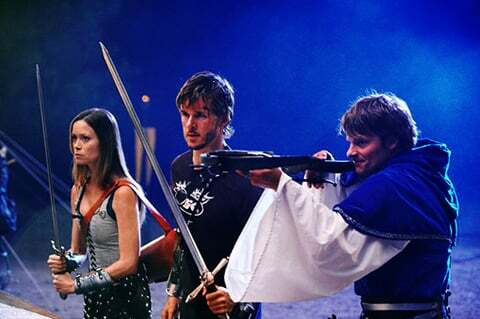 The film stars True Blood’s Ryan Kwanten (nailing down the female demographic), Game of Thrones’ Peter Dinklage (landing the male crowd who loved the HBO series), and tying it all together is geek goddess Summer Glau (forever the love of many nerds’ lives after her excellent yet brief run on Firefly). Also in the mix is the unmatched hilarity of Dany Pudi (whose name you may not recognize, but likely you love him as Abed on NBC’s Community), and the always amazing Steve Zahn. A more intriguing cast of characters has never been assembled. 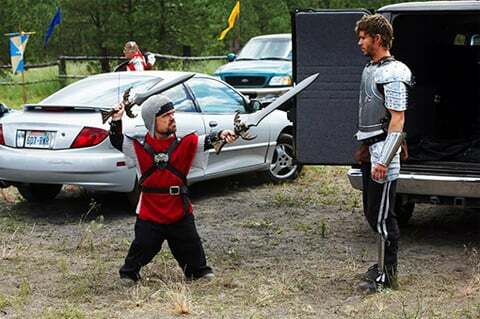 These new photos show our main characters wielding sword and crossbow after Zahn accidentally unleashes a succubus on a large campsite of Live Action Role Players. Zahn and Dinklage have dragged Kwanten to the event to try and cheer him up after a series of unfortunate events left him girlfriend-less, and band-less. Unfortunately, since Zahn cast the spell on Kwanten, the succubus has taken the form of his ex-girlfriend and proceeds to tears unsuspecting LARP nerds apart. Scope out the pictures below courtesy of EW. This film has me excited more than I should be, but everyone in it is awesome, and there’s a succubus. What’s not to love?